"Collect and save, collect and save." Profile: Wreck-Gar is the leader of the Junkions, and like his people, is a creature comprised of rusted scraps, dented odds and ends, chassis bits, and manifold parts - a walking, very powerful and all but indestructible Junkbot, i.e., a robot of junk. When he is hit by laser blasts and falls apart, he reassembles himself out of the junky remains of his body and available junk heaps that constitute the structure of his planetoid, and keeps right on coming. And his speech and attitudes are also a junkyard-like collection of languages and broadcast fragments overheard from all over the universe - scraps of T.V. commercials, soap opera dialogue, old song lyrics and valentine inscriptions merged with quotations from history given out of context. As Wreck-Gar might say, "Holy Mackeral, Mrs. Olson, your mountain-grown easy-listening sidekick, kimosabe, wishes you have a nice industrial-strength day. Film at eleven or not." 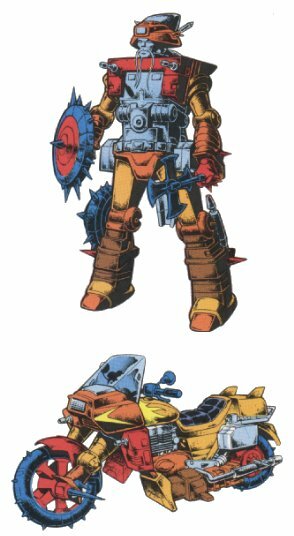 Abilities: Wreck-Gar can transform into motorcycle mode and back to robot mode continuously in battle, so that his "ruins" become his transformed mode and back again any time he takes a direct hit. 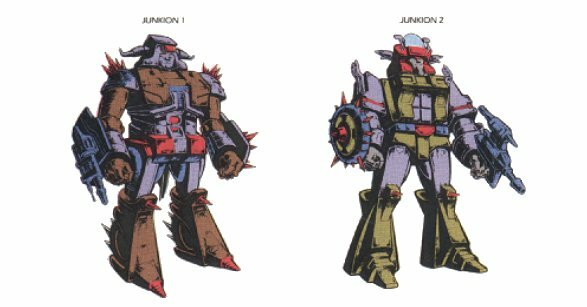 In robot mode, he carries an armor axe and a decelerator laser that inhibits an enemy robot's flow of cerebral impulses. Speed: 160 mph. Range: 100 miles.